Do you remember the story of Androcles and the Lion? It’s one of Aesop’s Fables that often appears in children’s books. Remember how Androcles escaped slavery only to face a lion in the forest? It’s as if he was jumping from the frying pan into the fire. Thinking the lion would kill him, he begins to run away. But as he does this he hears the lion moaning in pain. So, he turns around and discovers that the lion has a thorn embedded in its paw. What to do? Does he remove the thorn and risk death, or does he turn his back on the suffering lion? In spite of his fears, Androcles pulls the thorn out of the lion’s paw. As for the lion, he joyfully licks the face of his savior, and from that moment on they become good friends. Now, their friendship will get another test when both get captured and face each other in the arena. When the lion refuses to kill Androcles, the emperor is so amazed that he pardons Androcles and frees the lion. And they live happily ever after! Paul had a thorn of his own, but there wasn’t an Androcles around to remove the thorn. Paul asked God three times to remove his thorn, but God appears to refuse his requests, and so he decides that the thorn, which he describes as a “messenger from Satan sent to torment” him, must be God’s means of keeping him humble. When you read a letter, you only get one side of the conversation. But, there’s always a narrative standing behind the letter, and if you dig into the back story, you get the bigger picture. It seems clear from Paul’s two Corinthian letters, that this is a rather dysfunctional church. Although Paul planted this church, the surrounding culture had negatively influenced its development. While Paul preached an egalitarian message, certain players in the church were rather adept at playing power politics. They tried to bring a social caste system into the church that would give them power. It also led to conflict within the church and resistance to Paul’s leadership. They didn’t seem to think much of Paul, and so they became a thorn in his side as well. That is, in addition to whatever physical issue afflicted him! It’s clear from the letters that these issues were both economic and spiritual. Paul’s opponents seem to come from the wealthier caste, and they demanded to have power and authority in the church. Perhaps thinking that their wealth was a sign of divine blessing, they saw themselves as spiritual giants. They had come to see themselves as standing on a higher plane than the rest of the people, including Paul. Perhaps Paul’s decision to support himself by making tents contributed to this perception. So, even if Paul was an apostle, they were, in their own estimation, “super-apostles.” They bragged about their visions and ecstatic experiences. Look at me, they said, we’re more spiritual than the rest. Paul knew how to mix it up with the best, but he replied not by bragging on his own spiritual experiences, but by focusing on his own weaknesses. Now, he did know the story of someone who had been caught up in paradise some fourteen years earlier. He’ll brag on that person, instead – though it would appear that he and this person are one and the same! But, he resists putting the focus on his own experiences, which rivaled anything his opponents could muster. In reading today’s text, my thoughts went back to my teen years, when I was active in Pentecostal churches. These churches emphasize ecstatic spiritual experiences, such as speaking in tongues and prophetic utterances, and I remember people taking great pride in their prowess with such spiritual experiences. They enjoyed telling their stories because it brought attention to them, and gave them power over others. It’s easy to get caught up in this, even if you didn’t have the same spiritual experiences. Just being around spiritual giants gave you a sense of importance. Yes, I got caught up in it too! But, you don’t have to go to Pentecostal Churches to find people who find power and glory in telling their spiritual stories. They might find glory in their ability to quote scripture or maybe the eloquence of their prayers. They hold themselves up as spiritual exemplars, and try to exploit their persona to gain power over others. Paul had to face this, as did Jesus. Remember that Jesus’ primary opponents were members of the religious establishment, who saw themselves as spiritually better than their neighbors. Like Paul’s opponents, they became thorns in Jesus’ side! Although his opponents liked to trade stories of their spiritual triumphs, Paul refuses to go along. Such actions only make people look foolish, so instead of bragging about how spiritual he is – and he has had plenty of ecstatic experiences to take pride in – he simply rests in the grace of God, which he deems sufficient. Yes, as Paul says in Philippians, “I can do all things through Christ, who strengthens me” (Philippians 4:13). The grace of God, which Jesus shares with his followers, is sufficient for us all. We don’t have to use our spiritual experiences as fodder for our efforts to gain power over others. Instead, as we find power perfected in weakness, we find the power necessary to do the work of the kingdom. So where do we see this power in weakness present? Well, consider a phrase we often use: “From the mouths of babes.” Children don’t have power or influence, and yet in their seeming innocence and even powerlessness, they can speak words of great wisdom and vision; that is, if we’re willing to listen for God’s voice in their words. Then there are those whom we deem disabled – whether it is physical, emotional, or intellectual. There are many people whom our society deems weak, and yet they too can be used by God. In September we’ll have the opportunity to hear theologian Amos Yong speak on The Bible, Disability, and the Church. In his book on this topic, Dr. Yong shares the story of his younger brother who has Down Syndrome. Although Dr. Yong has become a well-regarded theologian, he shares how his brother has become an equally important spiritual blessing to so many people. What some would see as a weakness, in God’s grace becomes a strength. So, who in our midst is able to glorify God through what society considers to be a weakness? Part of the problem afflicting the Corinthian church is that Paul’s opponents think that there’s a scarcity of spiritual blessings, and they take pride in gathering up as much of this “blessing” as possible. Just as they failed to share their food when the community gathered, they tried to hoard spiritual power as well. Paul offers a different view of things. He finds power in weakness. His thorn, whatever it might be, doesn’t keep him from fulfilling his calling. That’s because God’s abundant grace is sufficient for all. What looks like weakness is an opportunity for God to work powerfully. To put it a different way, even though we’re a small church that lacks the programs and media savvy of much larger congregations, that doesn’t mean God can’t use us to bless the community. It’s a bit like the small grocery store I worked for during high school. We couldn’t compete with the Safeway across the street in terms of price or quantity of products offered, but we could offer quality service. And that’s how we competed. So, what weaknesses are present in your life that give God the opportunity to perfect God’s grace? Where are you weak so that God might be strong? 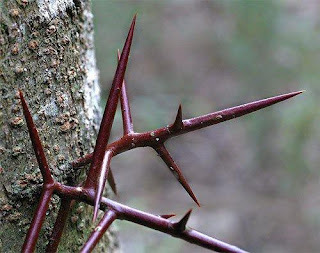 What are the thorns in your life that keep you humble so that God can use you? Jesus went home to Nazareth, and the people were amazed at his ability to teach. They were also offended by it. After all, they said: we know this guy. We know his father, who is nothing more than a handyman, and we know his mother and his siblings as well. And Jesus responded – “A prophet is not without honor except in his own town, among his relatives, and in his own home” (Mark 6:1-4).